Agranulocytes (includes Lymphocytes and Monocytes). This classification depends on whether granules can be distinguished in their cytoplasm using a light microscope and conventional staining methods). All the white blood cells are able to move like an amoeba, and can migrate out of blood vessels into the surrounding tissues. Note - it is easy to confuse the different leucocytes in blood smears. To identify them, you need to look for the shape of the nucleus, and compare their size, relative to that of a red blood cell. Once you have looked at the examples below - have a go for yourself - click here and see if you can identify the 'mystery' cells. 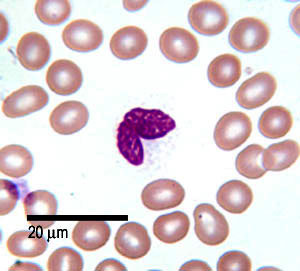 This shows a neutrophil in a blood smear. 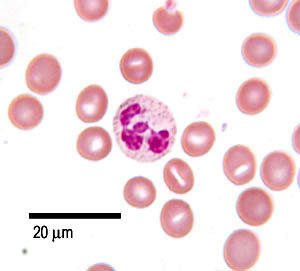 The neutrophils are 12-14 µm diameter, and so look bigger than the surrounding red blood cells. There is a single nucleus, which is multilobed, and can have between 2 and 5 lobes. The chromatin in the nucleus is condensed. This means that there isn't protein synthesis. There are few organelles in the cytoplasm. Neutrophils are the commonest type of white blood cell found in a blood smear. They make up 60-70% of the total amount of white blood cells. secretory granules in salmon pink cytoplasm, anti-microbial enzymes. Neutrophils are born in the bone marrow. They circulate in the blood for 6-10 hours, and then enter the tissues. They are motile, and phagocytic and will destroy damaged tissue and bacteria. They self destruct after one burst of activity. They are important in inflammatory reactions. 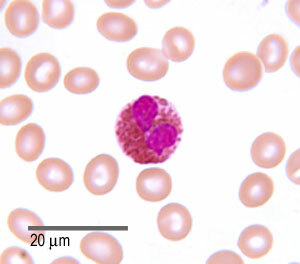 This picture shows an eosinophil in a blood smear. These cells are 12 - 17 µm in diameter - larger than neutrophils, and about 3 times the size of a red blood cell. You can see that eosinophils only have two lobes to their nucleus. These cells have large acidophilic specific granules - these stain bright red, or reddish-purple. These granules contain proteins that are 'destructive' and toxic. Eosinophils are fairly rarely found in blood smears - making up 1-6% of the total white blood cells. These cells are born in the bone marrow, and migrate from the peripheral blood system after a few hours, into loose connective tissue in the respiratory and gastointestinal tracts. They phagocytose antigen-antibody complexes. They also produce histaminase, and aryl suphatase B, two enzymes that inactivate two inflammatory agents released by mast cells. A high eosinophil blood count may indicate an allergic reaction. Eosinophils are also important in killing parasitic worms. 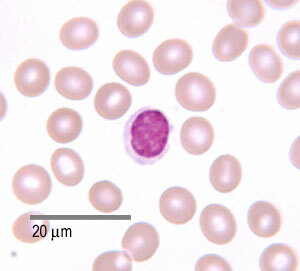 This photo shows a picture of a basophil. They are 14-16 µm in diameter, contain lots of deep blue staining granules (basic) and a bilobed nucleus.The granules contain heparin, histamine and serotonin. prostaglandins and leukotrienes. Basophils are the rarest type of white blood cell, making up only 1% of the white blood cells found in a blood smear. These cells are involved in immune responses to parasites. They have IgE receptors and the granules are released when the cells bind IgE. These cells also accumulate at sites of infection, and the release of prostaglandins, serotonin and histamine help to increase blood flow to the area of damage, as part of the inflammatory response. The degranulation - release of histamine also plays a role in allergic reactions such as hay fever. The rest (around 10%) are larger, about 10-14µm in diameter. These larger cells have more cytoplasm, more free ribosomes and mitochondria. Lymphocytes can look like monocytes, except that lymphocytes do not have a kidney-bean shaped shaped nucleus, and lymphocytes are usually smaller. Larger lymphocytes are commonly activated lymphocytes. They have a small spherical nucleus and has abundant dark staining condensed chromatin. Not much cytoplasm can be seen, and it is basophilic (pale blue/purple staining). Think - what does this mean about the levels of protein production in these cells? Are they high, or low? 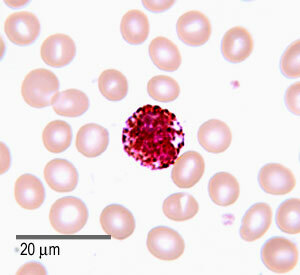 These are the second most common white blood cell (20-50%), and are easy to find in blood smears. Although the cells look similar there are two main types, B-cells and T-cells. B-cells develop in the bone marrow. T cells are born in the bone marrow, but are matured in the Thymus. There will be more on this in the section on the immune system. The B-cells develop into plasma cells which make antibodies, The T-cells attack viruses, cancer cells, and transplants. This is a photo of a monocyte in a blood smear. These are the largest type of white blood cells, and can be up to 20µm in diameter. They have a large eccentrically placed nucleus, which is kidney bean shaped. They have abundant cytoplasm, and some fine pink/purple granules in cytoplasm. Monocytes are the third most common type of white blood cell; about 2-10% of leucocytes are monocytes. Monocytes in the circulation are precursors of tissue macrophages that are actively phagocytic. Monocytes circulate in the blood for 1-3 days, and then migrate into body tissues, where they transform into macrophages. They will phagocytose dead cells and bacteria. Some monocytes can also transform into osteoclasts. Monocytes are important in the inflammatory response.